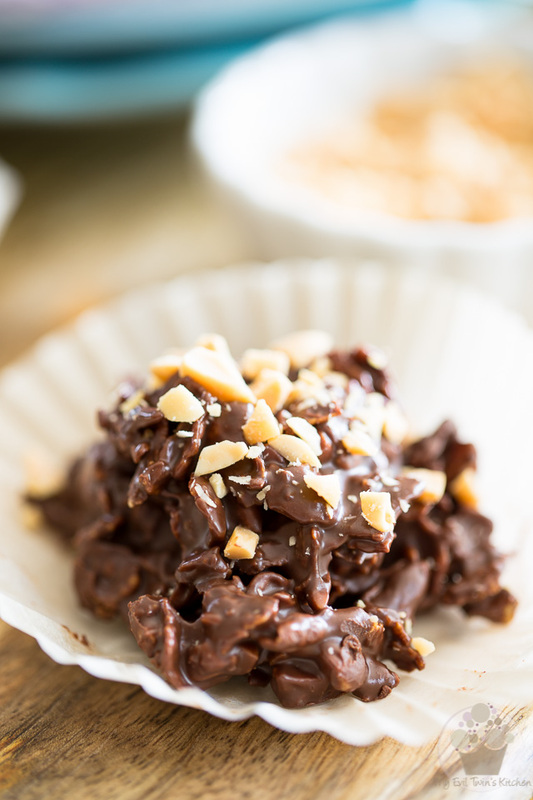 4 ingredients and a total of 2 bowls are basically all you’re gonna need to make these deliciously addictive Peanut Butter Chocolate Corn Flakes Clusters. 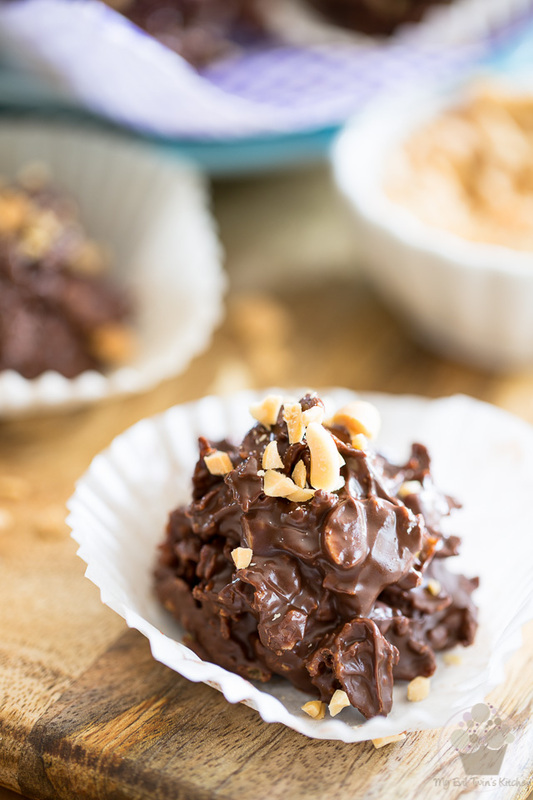 Remember how I recently told you that these Peanut Butter Chocolate Corn Flakes Clusters were the last “peanut butter” recipe that I’d be making for a while, because I’d just polished off my last jar of homemade peanut butter and decided that I wouldn’t be making more for a while? 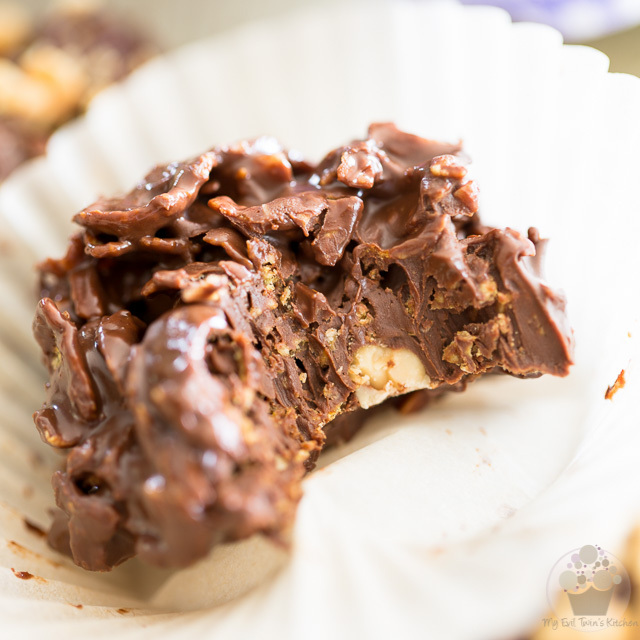 In case you don’t, that was like WAAAAAAY back when I made my Peanut Butter Chocolate Rice Krispies Treats. Okay, perhaps it was not exactly what YOU would call waaaaaay back, but to me, considering the fact that I STILL haven’t made a fresh batch of peanut butter since that day, I can totally affirm that it’s been an awful long time. And now, writing this post feels like some kind of self-inflicted torture. 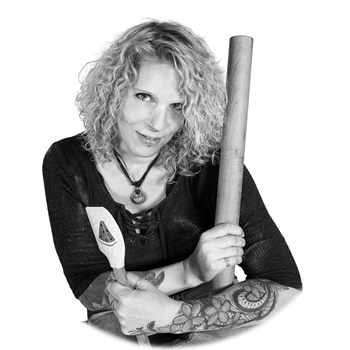 I get the feeling that once I’m done writing, I will be totally done for… I won’t be able to resist for a second more and you’ll find me running, not walking, to the kitchen so I can whip me up a fresh batch of delicious Peanut Butter. But first, I need to share this recipe with you. Good thing is today, I’m sharing the easiest recipe in the world, for a change. You know how my recipes usually tend to be super long and complicated and have like 2 million steps to them and dirty just about every single bowl that you happen to own, and perhaps even have you borrow one or two from the neighbors? Well, not this one. Today’s recipe uses only 4 ingredients and a grand total of 2 bowls, one of which you won’t even need to clean. Just a quick little dry wipe will totally do the trick. Well, okay, if you’re gonna get technical on me… you’re also going to need a mixing spoon or spatula and a cookie sheet, which you will need to line with parchment paper or a silicon baking mat. And, you’re gonna need a knife to chop your peanuts (unless you bought them pre-chopped, if there actually exists such a thing as pre-chopped peanuts, that is) and a medium-sized spring-loaded ice cream scoop, if you happen to own one and, like me, jump at every possible occasion to use it! But then that’s it, I swear. 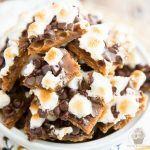 Honestly, you won’t believe how incredibly easy these are to make, and after you’ve tasted them and found out just how insanely delicious and addictive they are, you’ll be wanting to make them all the time. For realz, boys and gals. Trust me, truly decadent recipes don’t come any easier than this one. 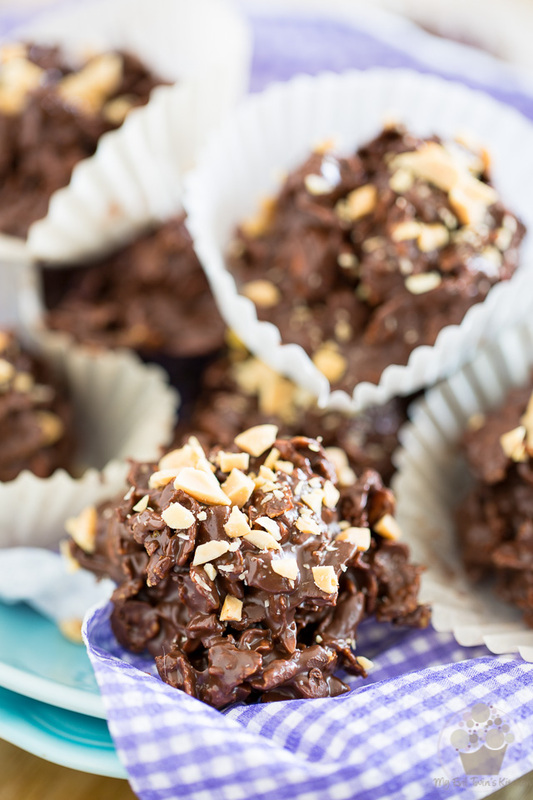 They’re SO easy to make, a 2 year old could probably tackle them… with very little help! See? See? I didn’t lie! That’s the only bowls you’re gonna need, right here. TWO bowls. Uno, dos. That’s it, that’s all! Grab the largest of the two and in it, combine the chocolate chips and peanut butter. In the other one, mix your Corn Flakes and chopped peanuts. 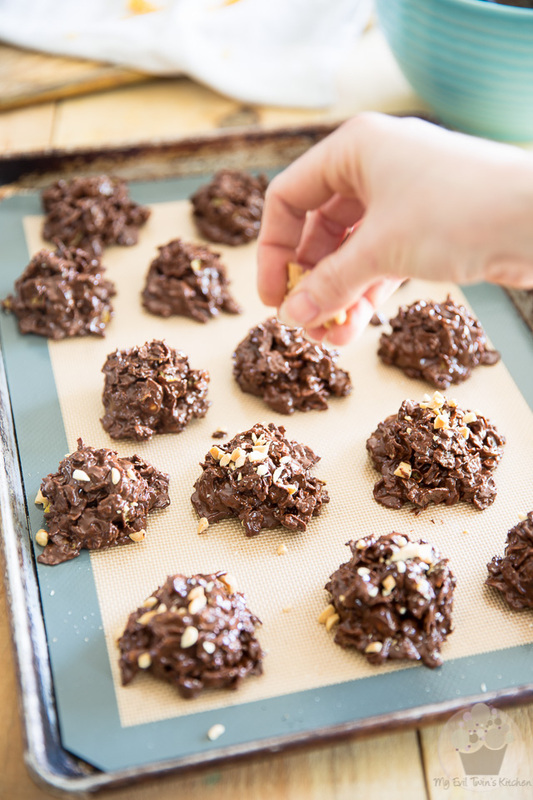 You’ll then want to line a cookie sheet with parchment paper or a silicon baking mat. Oh, and grab a spatula or spoon, to do your mixing. To melt the chocolate and peanut butter, place them in the microwave for 1 minute. Then, allow them to rest for 1 full minute and finally, stir delicately for 1 minute. 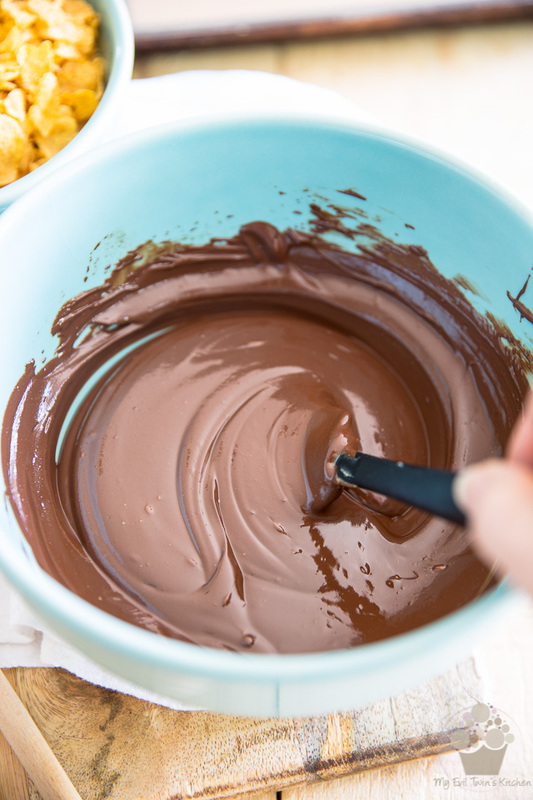 IF there are still lumps of unmelted chocolate left after that, repeat the process but go for only 30 seconds this time. 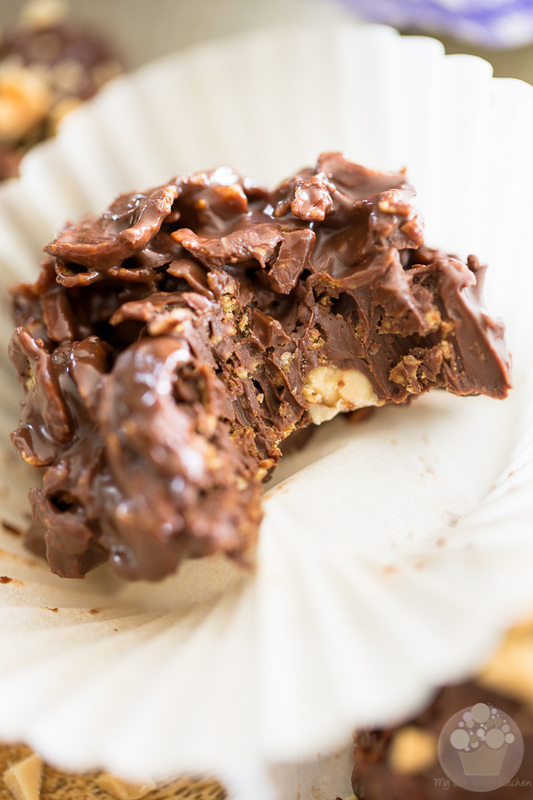 The chocolate chips should be completely melted and fully combined with the peanut butter, but the mixture should not be allowed to get overly hot. …and stir until the cereal is completely coated. If you happen to own a medium-sized spring-loaded ice cream scoop, please take it out and use it now. It’s like the best tool for the job. I chose to make 15 large clusters, but you could decide to make yours smaller, if you wanted to. There is no exact science here, really; you can make your cookies any size you want. 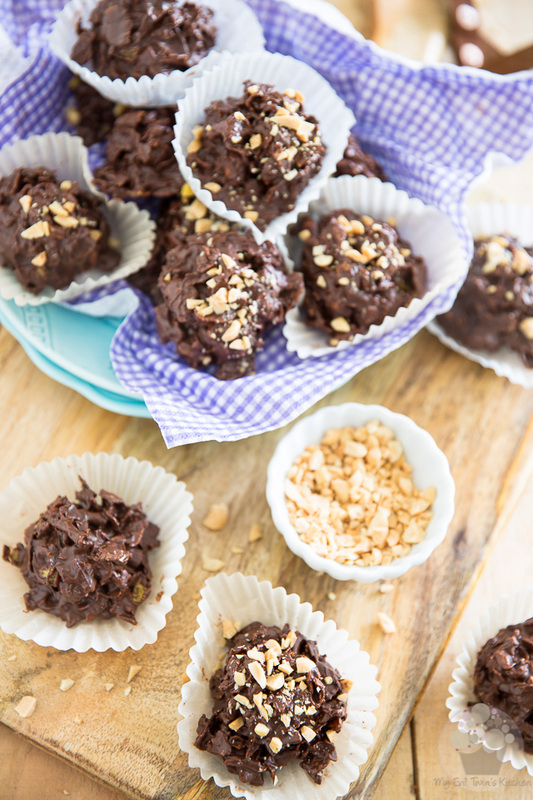 And you can also decide to garnish them with a sprinkle of chopped peanuts… or not! The one thing that is non-optional though is that you now need to send your clusters to the refrigerator until they are completely set, which will take an extremely loooooooong 30 minutes. Probably the longest half hour of your life. I know, unfair, right? And the worst part is, you don’t even have a kitchen to clean to keep you busy while you’re waiting. Has it been 30 minutes already? Are you sure? Alright, then. I guess you can devour at least one of your cookies right away, while they’re still super fresh and soft and almost creamy… The rest, you should definitely place in an airtight container, somewhere way out of sight. The choice of where to keep that container is entirely up to you. 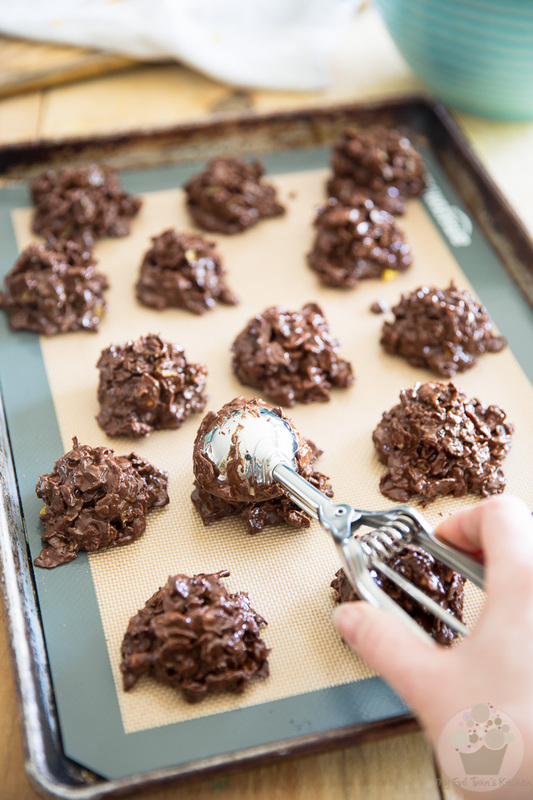 In the refrigerator, your clusters will become somewhat firm and super crunchy. Kept in the pantry (providing that it’s nice and cool in there, NOT like a gazillion degrees, cook-your-eggs-straight-on-the-shelf kinda temperature) they will remain much softer and divinely crispy. Now, if you’ll excuse me, I think I’ve got some peanut butter to make! And YOU, need to make these! 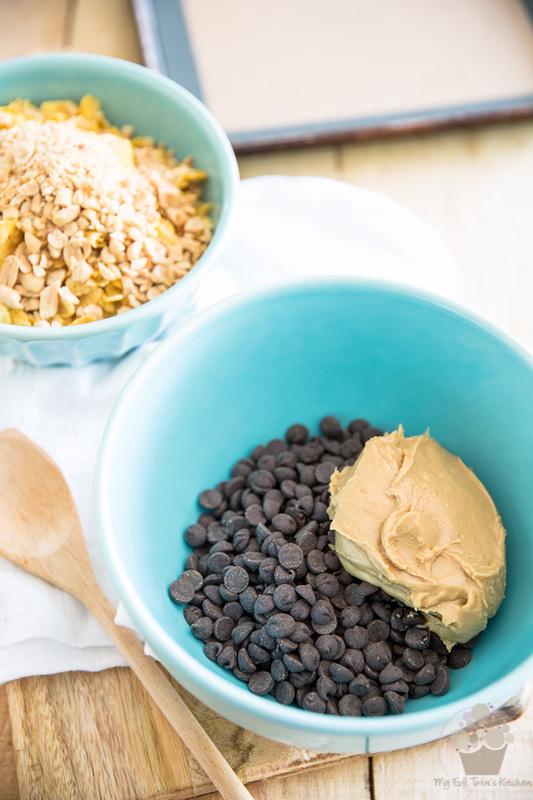 In a large mixing bowl, combine the chocolate chips and peanut butter and place that in the microwave for 1 minute. Allow to rest for 1 minute and then stir for 1 minute. If there are still lumps of unmelted chocolate left, repeat the process but for 30 seconds this time. 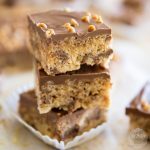 The chocolate chips should be completely melted and completely combined with the peanut butter, but the mixture should not be allowed to get hot. 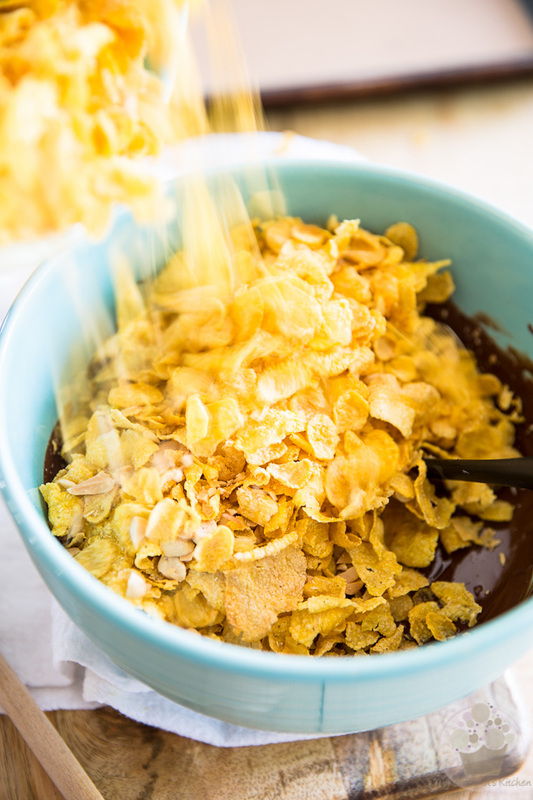 Add the Corn Flakes and chopped peanuts and stir until the cereal is completely coated. 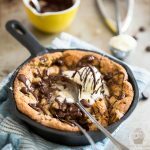 Drop the mixture by the tablespoonful (a medium-sized spring-loaded ice cream scoop works wonders for this) onto a 13" x 18" cookie sheet that's been lined with parchment paper or silicon baking mat. Garnish with a sprinkle of chopped peanuts, if desired. 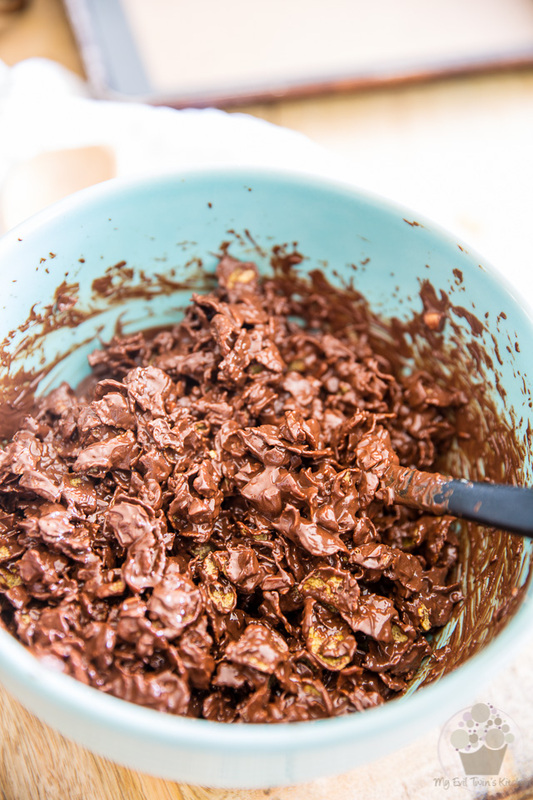 Send your clusters to the refrigerator until set, about 30 minutes. 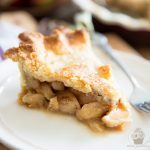 Devour at least one right away and keep the rest in an airtight container, either in the refrigerator (where they will become somewhat firm and super crunchy) or the pantry (where they will remain much softer but still divinely crispy). love these! they so remind me of my childhood. and peanut butter and chocolate is always an incredible combination!